Update: The 32GB white version is on sale at Sam's Club for just $99 with free shipping, arguably an even better deal, right here. Thanks, Amy! Far be it from me to tell you whether or not you should buy an $89 tablet, but it is my job to tell you there is such a thing - thanks to a hefty price cut from Amazon on the gray version of the ASUS MeMO Pad 7. It's just $88.86 right now, which is absolutely nuts if you stop and think about just how cheap that is. That's roughly as much as a month of smartphone service on Verizon or AT&T, or 20 gallons of gas, or 10 Chipotle burritos. Point is, you're not going to find a whole lot of tablets out there from respectable manufacturers - with Play Store certification - for under a hundred bucks, let alone 90. Granted, this price drop is almost certainly because the MeMO Pad HD 7 is out soon, and it'll cost just $150. 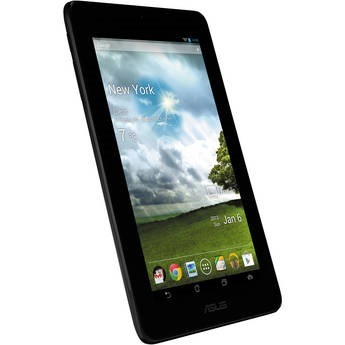 But at roughly $89 (at least $10 cheaper than anywhere else we could find, and only $4 more than the official ASUS refurb), this would make a great platform for a little ROM / kernel flashing, or just something you can leave around the house for relatives or children to use. It's not actually too terrible, either - a 1GHz dual-core processor, 1GB RAM, Mali 400 GPU, 1024x600 display, 16GB of internal storage (a lot for a cheapo tablet), microSD slot, front-facing camera, and Android 4.1. Most importantly, it's fully Google-approved - meaning the Play Store and the whole suite of Google apps. Not cutting edge by any means, but hey, for this kind of money, who's complaining?